As many as 50 people have died in storms over the past three days in Afghanistan, including 25 shepherds lost in a blizzard, a government disaster management official said on Monday. Also among the dead were 11 people killed in separate incidents in roof collapses in heavy rain in Kabul province, said Omar Mohammadi, a spokesman for the Afghanistan National Disaster Management Agency. Another 44 people were hurt in weather-related accidents. On Sunday, U.S. Defense Secretary Jim Mattis said the bad weather had forced him to scrap a visit to Afghanistan. Amid a war that has displaced hundreds of thousands of people, the United Nations estimates that more than 9 million Afghans are in need of humanitarian aid, including basic food and housing. The deprivation has been exacerbated by bad weather that has taken a heavy toll, especially in remote areas. 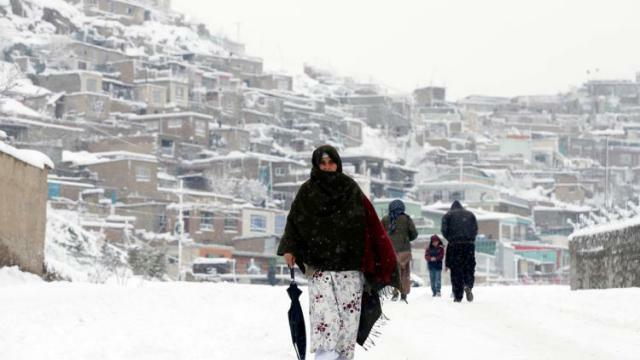 "At least 239 people have been killed and 214 wounded during the past two months of heavy snow and rain in 22 provinces of Afghanistan," Mohammadi said. More than 520 houses were destroyed and about 420 damaged over the same period, he added. Last week A number of avalanches caused by unprecedented snow storms in Afghanistan and Pakistan over the weekend have claimed 107 lives with many more injured and almost 200 homes destroyed along with the death of hundreds of livestock.